Largest of the lizards, mosasaurs are common fossils in marine deposits in many places around the world. 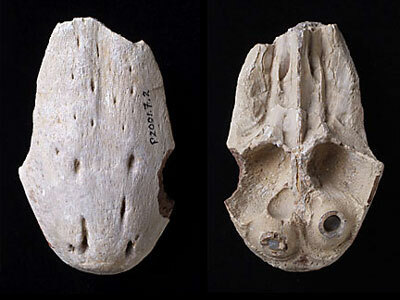 The specimen shown here is the tip of a mosasaur snout and identifies it as a Platecarpus, one of the late Cretaceous mosasaurs found in the chalk rocks of Kansas. Its form distinguishes it from several other 70-million-year-old Kansas Chalk mosasaurs such as Tylosaurus, Mosasaurus, and Clidastes. Many of these marine reptiles reached 30 feet or more in length, and they had long tooth-lined jaws for catching fish and a tall flattened tail that was its main swimming device. Its fin-like limbs were merely for steering. One gigantic species may have reached 60 feet in length and another, Globidens, with its low-crowned bulbous teeth, probably fed on mollusks by crushing their shells. This fossil specimen, along with a few other bones, was collected by the Anderson family and brought to the Museum for identification through the Museum's Object Identification Program. Anderson subsequently donated some of his finds, including this mosasaur snout, to the Museum's collections. Although this particular specimen is not on display, you can see its relative Mosasaurus in the Museum's Dinosaurs and Fossils Gallery.